Welcome to this month's newsletter -- Are You a Good Runner? If you enjoy reading this issue, please share it with your running friends. What does it mean to be a good runner? If two runners compete in a race, is the faster one necessarily the best one or are there other factors to consider? If the faster runner is pushing himself to the limit, straining his muscles and respiratory system to the limit, gives no thought to his form and feels sore and expended at the finish, is he a better runner? If the slower runner runs at the maximum pace that is comfortable for him, controlled and comfortable breathing, maintains good form to the finish, is he a better runner? Wouldn't you agree that the slower runner if he continues to run this way, has a better chance of being able to run injury free and for the rest of his life? But this doesn't mean that he will always run slower to accomplish this. I believe that a good runner is a runner who wants to develop naturally and has patience with his body. He will push his body but only insomuch that he remains reasonably comfortable. There is only minor strain on his muscles as he runs seemingly effortless and will go faster based on feedback from his body. He won't get injured because he is in tune with his body's capability in each moment. When his body is ready, he can go faster and it will feel easy because his mind and body are in sync. Many refer to this experience as runner's high. When you experience runner's high or "being in the zone", you know you will not get injured because you are running with a perfect form and at a perfect pace for your body. "Learn ease and grace in movement; it is more important than you think." A good runner strives to enjoy every moment of every run and is dedicated to making running fun and easy. He focuses on the present moment while running and uses his senses to help keep him present. He smiles frequently and keeps a positive attitude while running. He doesn't ignore pain or try to resist it. He feels any pain fully so he can learn from it. A good runner strives to run in the zone on every run. He is not concerned with short term goals and uses races as training in the practice of developing into a better runner. Each race may have a different goal. It may be to build distance, to build mental strength, to comfortably maintain a certain pace over a certain distance, to maintain proper running form throughout the entire race (even on hills), or other goals that are part of developing and learning. However, the goal will not be to push himself to achieve a PB that his body is not ready for and cannot achieve comfortably which would result in soreness, fatigue and possibly injury. Use races to learn more about yourself and your body. Use them to develop and grow as a person and a runner. Experiment and play with each experience, always keeping growth and development as the priority. The outcome of any one race is not important. During a race it is so easy to get caught up in a competition with the other runners, especially if they begin to pass you. Continue to run your own race, stay in your game and remember what your goal is for this race. Racing can teach us many things, so use them to learn and grow. If you suffer from pre-race anxiety, you can let overcoming it be the goal for one of your races. It will help you develop confidence in your mental strength. We all have the ability to be mentally strong, but it takes practice—the same as any skill you want to develop. Do a longer distance than your last race to gain confidence in longer, faster running. Build mental strength. Racing requires more focus than regular running as you are running faster than you normally do. It is most important then to guard your thoughts and stay positive during each race. Many runners have had awful race experiences simply as a result of negative thinking. Maintain a good running form throughout the entire race. Sometimes when we get tired or unfocused, we let our form collaspse and try to run through it. This makes running difficult, inefficient and very unpleasurable. Check your form regularly to ensure you are maintaining your form and running efficiently. Maintain a certain pace over a certain distance. This would be a pace determined by your body and not one recorded by a watch. Use your body as a guide to determine a pace that you feel you can maintain for the entire length of the race. It will feel a little uncomfortable as it will be faster than you normally run. Use the race to practice using your body as a pacing guide and don't look at your watch. This is between you and your body. You body will provide the best guidance you could possibly receive! So what about you? Are you a good runner? 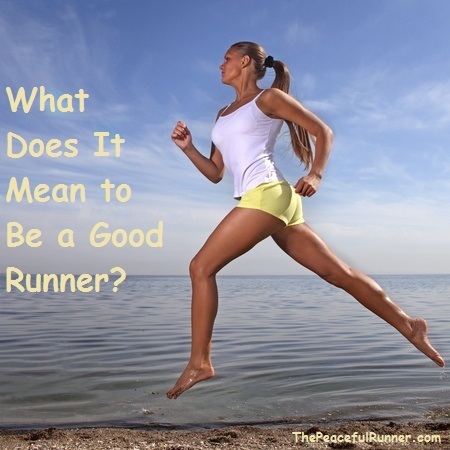 What do you think it means to be a good runner? Back to top of Are You a Good Runner?